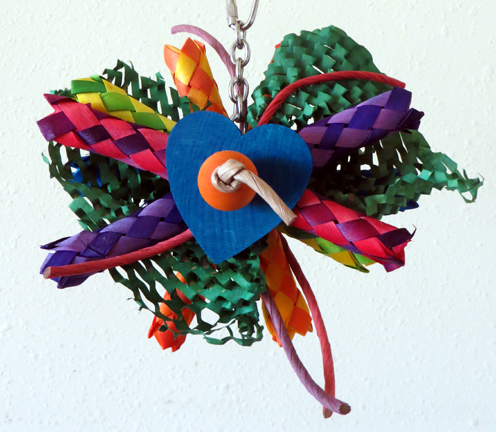 The Butterfly is full of textures ... from the waffle paper, to the finger traps, colorful 2" wooden heart & wooden ball on both sides, held together with paper rope, with a few added paper rope whiskers, all hung from a nickel plated welded chain and topped with a quick link for easy hanging. This is a great toy with lots of movement, color and textures. Be sure to open up the paper rope and stick in a nut or other goodie to encourage foraging! Perfect for the smaller to mid sized beaks in your house!